What is Quantity Discount & Tiered Pricing about? Set up a discount for multiple items in percentages or as a fixed amount. App works with any theme and doesn’t require any manual modifications during the installation or app usage. The Quantity Breaks bar is easy to customize, which makes your Shopify store look quite impressive. You can change the price tiers for a product, several ones, or a collection just in 1 minute! The devoted team of tech support specialists is online to help you solve all the questions and concerns you may have. See a mobile or tablet optimized bar for Android or iOS using your phones. Do you want your clients to purchase more items from your store? Establish close relationships with your customers by offering them a discount for additional purchases. The Quantity Discount and Tiered Pricing app sets smart discounts for different kinds of products on Shopify. 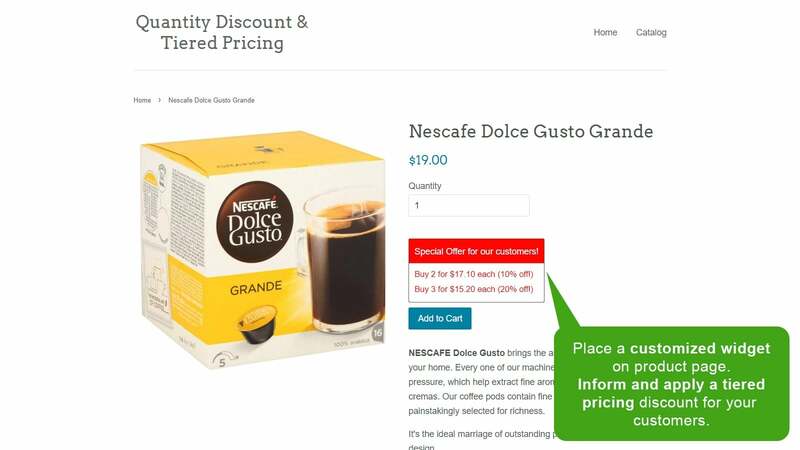 It’s possible to apply various discounts for multiple product groups or single products. It takes just a few clicks to automate the process of creating the necessary pricing breaks. Keep duplicates at bay! The Quantity Discount and Tiered Pricing app keep the inventory of your Shopify store intact by applying its rules only on the products that are in a client’s cart. We have definitely seen an increase in larger orders since we installed the app. Awesome app! Definitely Increases AOV. …the customer support has been 5-star! Installation is easy and awesome. Get Shopify Quantity Discount App now!